Egyptian President Mohamed Morsi's Sunday decisions to retire Hussein Tantawi and Sami Anan, the two highest ranking members of Egypt's Supreme Council of the Armed Forces (SCAF), terminate the SCAF's contentious 18 June constitutional addendum, and appoint a new vice-president have sent shockwaves across Egypt. Many political observers, meanwhile, have expressed surprise at how easily the SCAF's grip on power – which appeared to tighten during Egypt's transitional phase – was ostensibly overturned in a single day. "Morsi must have seen this as a good chance to sideline the top-ranking military leadership," said retired general and strategic expert Qadri Saeed. "The lower ranks were not happy with their superiors' recent performance and their excessive involvement in politics at the expense of the army. And they were especially demoralized following last week's Sinai border attack." "Meanwhile," Saeed added, "average Egyptians were angered that Sinai was being violated, while it seemed as if the authorities weren't giving the issue the attention it deserved." Following the 5 August attack near Egypt's border with the Gaza Strip that left 16 Egyptian border guards dead – perpetrated by as-yet-unknown assailants – the Egyptian armed forces over the course of the last week have launched the largest military operation in the Sinai Peninsula since the signing of the 1979 Egypt-Israel Camp David peace agreement. "Everyone blamed the generals after the Sinai attack, which for many people reflected the need for the army to relinquish its political role and focus on its original mandate [protecting the country from attack]," said Saeed. "The country's military leaders failed to carry out their job properly, and had to be replaced as a result of this shortcoming." "The generals became too old and rigid; they've spent too much time in power, as their tenure was prolonged due to the revolution and the subsequent transitional period," Saeed added. "What's more, there's a major counter-terrorism campaign now being waged in Sinai that must be overseen and conducted by specialists, which is why I believe Morsi appointed the head of military intelligence to the post of defence minister." An intelligence man, Saeed asserted, "will have a better grip on the situation than the generals did." Political analyst Ayman El-Sayyad, for his part, believes Morsi's Sunday announcement "was inevitable." "The Sinai incidents only brought it forward," he said. "The border attack revealed how much the military had been focusing on politics to the detriment of its military responsibilities, which was reflected in its poor response to the attack on the border." Notably, a military source on Monday was quoted by Al-Ahram's Arabic-language news website as saying that junior army officers, unhappy with how the defence ministry was being run, had pined for new blood at the top of the military establishment. The same source added that young officers had been looking forward to the end of the military's post-Mubarak political role. The source went on to say that Morsi's choice of General Abdel-Fattah El-Sisi for new defence minister, who had been one of Tantawi's closest aides, constituted proof that Morsi had consulted with the SCAF before taking his surprise decision. "The consequences of Morsi's decisions will mainly depend on developments in Sinai," said Saeed. According to Saeed, the president's surprise move had been "only a matter of time." 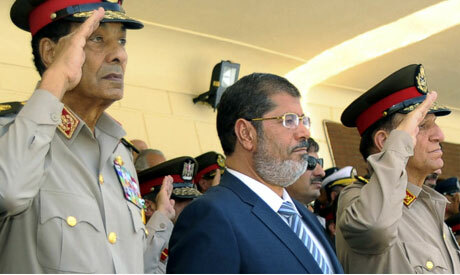 "I suspect Morsi had planned to do it [sideline Tantawi and Anan] following the upcoming parliamentary elections," he said. "But after last week's Sinai attacks, the desired personnel changes simply couldn't wait any longer." Along with sending the generals into retirement, Morsi's 12 August Constitutional Declaration abrogated the SCAF's 18 June constitutional addendum, effectively restoring the president's full executive powers. The new declaration also temporarily transferred legislative powers from the SCAF to Morsi until new parliamentary elections are conducted (to be held within 60 days of the approval of a new constitution via public referendum). Morsi's Constitutional Declaration also puts Egypt's constitution-drafting process under the president's control, after the 18 June constitutional addendum had given the SCAF the authority to draw up a new Constituent Assembly (tasked with drafting a new national charter) in the event that the current assembly was deemed "unable to carry out its mandate." The new declaration, by contrast, gives the president the right to form a new Constituent Assembly if the current one – which faces the risk of being ruled unconstitutional by Egypt's judiciary – is prevented from carrying out its responsibilities. "A close observation of the sequence of events within the past 18 months reveals that the balance of power between the military and the Muslim Brotherhood had actually been in favour of the latter," said analyst El-Sayyad. "And the Brotherhood has reaped the benefits of its being on the stronger end of the rope when Morsi took office." El-Sayyad, for his part, hailed Morsi's decisions, which, he said, had "brought a degree of stability" to the country's fraught political scene. "The decisions have effectively ended the ongoing power struggle between Egypt's presidency and the military," he said. "All accountability now falls on the president alone." "The nullification of the [SCAF's 18 June constitutional] addendum – which had many problems and restricted the president's authorities – was an even more important decision than the military and security reshuffles," added El-Sayyad. "The abrogation of the addendum and the modification of the [SCAF's 30 March] Constitutional Declaration effectively eliminated the SCAF's political jurisdiction." While Morsi's decisions eliminated the constitutional basis for the SCAF's political involvement, they also put full executive and legislative authorities – as well as control over the constitution-drafting process – in the hands of Egypt's first democratically-elected president. Reform campaigner and Nobel laureate Mohamed ElBaradei described Morsi's decision to end the SCAF's political role as "a step in the right direction." He nevertheless went on to warn that the concentration of both legislative and executive powers in the hands of one man conflicted with core principles of democracy, and should therefore only be a temporary measure. "We're between a rock and a hard place," said El-Sayyad. "Until new parliamentary polls can be held, we can either have legislative authority in the hands of a military entity beholden to the former regime, or in the hands of an elected, civilian president. In this case, the latter is preferable." "What's more, Morsi's constitutional modifications have maintained the timetable for elections and a new constitution, which suggest that he doesn't intend to abuse his temporary powers," El-Sayyad added. Saeed, for his part, does not expect Morsi's decisions to lead to any negative ramifications in the short term, "so long as he doesn't abuse the powers he gave himself." Morsi is the elected president, so, obviously, he should be in power. Anyone else, such as the UNELECTED military elite, trying to steal and infringe on his rights/powers should naturally worry us. After all they are the "dark servants" of Mobarak, the dictator and they protected Mobarak's interests over and above the state. Why do the Military elite want more power than required for their job? Islamic law according to whos interpretation? Sunni, Sufi, Wahhabi! The Mb was providing food for the oppressed when you were twiddling your thumbs. Egypt is a islamic country and likewise chose a islamic government live with it. The secular elite is very pro zionist remember during the eid when ordinary egyptians couldn't even afford a chicken for the celebrations they dined at the finest restuarants. The MB were the most persecuted group in the egypt they were tortured,killed,oppressed and still they kept their patience. But the MB need to bring back the dinar and dirham and ablosh the interest and paper money if their truly islamic. Theocratic Rule sounds more appropriate if done by the Vatican or any other TReligious Organisation with ordained priests in place. In Islam there Ordained Priesthoods do not exist. The MB is a religous organisation whose members are obliged to abide by moral etiques as required by Islam in their day-to-day conduct. .